In cases where the quality of the bone is Type 3 or 4, the need to increase the amount of bone tissue that will be in contact with the surface of the implant becomes essential to achieve excellent primary stability and to enable immediate loading., One possibility for optimizing this process is the modification of the surgical protocol by using the technique of undersized drilling, which has been suggested in the early literature as particularly useful for the immediate loading when inserting the dental implants in low bone quality sites. However, recent studies have demonstrated that under-preparation of up to 35% of the receptor bed does not have additional effects on initial stability. 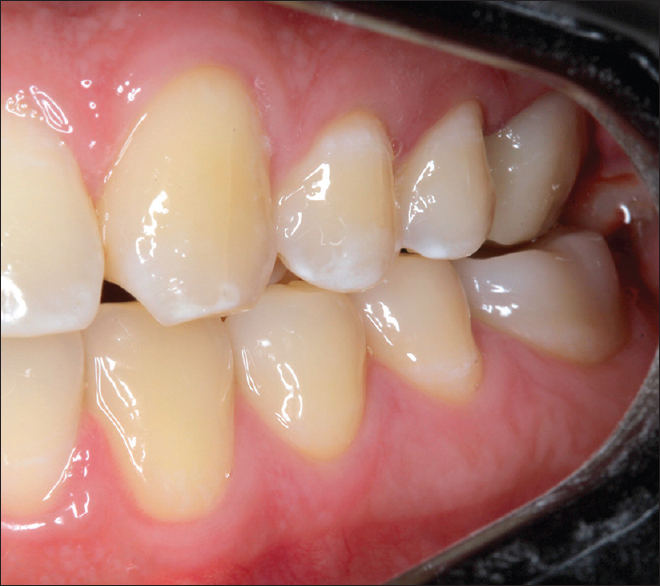 Hence, the aim of this case report is to present a clinical case of dental implant immediate loading using the technique of osseodensification to optimize the surgical site. A 44-year-old male with melanoderma was clinically diagnosed with a #26 root fracture with hopeless prognosis after cone-beam computed tomography (CBCT) (iCAT ®, Imaging Sciences International, Hatfield, PA, USA) [Figure 1]a. The plan for the patient was dental extraction immediately followed by implant installation. This clinical case was conducted according the Declaration of Helsinki of 1975, revised in 2000. The procedure was carried out in a private clinic, where the patient signed a free and informed consent form, authorizing the rights of disclosure of the images and the case to the author of this article. We used the Case Report Guidelines (CARE, www.care-statement.org) in this present study. Before dental extraction, [Figure 1]b asepsis of the oral cavity (with gluconate chlorhexidine 0.12%) and extraoral skin asepsis (with gluconate chlorhexidine 0.2%) were performed. After that, local anesthesia was administered with 4% articaine and 1:100.000 epinephrine. After tooth removal, initial bone instrumentation for the osseodensification was done using a pilot drill (1.7 mm), but only to establish the correct trajectory for the final restorative abutment and for the other drills to follow. The osseodensification process was started using a Densah® Bur Kit system (Versah ®, Jackson, Michigan, USA). Drilling steps were performed according to manufacturer's recommended protocol. The osseodensification drills all operated with the standardized 1200 RPM counterclockwise engine rotation with abundant saline solution irrigation. The sequence of drills used was: VT1828 (2.3 mm) (Versah ®, Jackson, Michigan, USA), followed by two more osseodensification drills, VT2535 (3.0 mm) and VT2838 (3.3 mm), in an attempt to install a 4.3 mm × 13 mm dental implant (INTRAOSS ®, São Paulo, Brazil) [Figure 2]a, [Figure 2]b, [Figure 2]c, [Figure 2]d.
After the drilling, the patient underwent computed tomography in an attempt to gain visualization of some bone compaction in the new dental socket. In the next step, the implant was inserted in the surgical site with a torque of 45 Ncm [Figure 3]a and the mean of the resonance index ±73 implant stability quotient (ISQ) [Figure 3]b (Osstell ®/W&H ®, Gothenburg, Sweden) was measured. 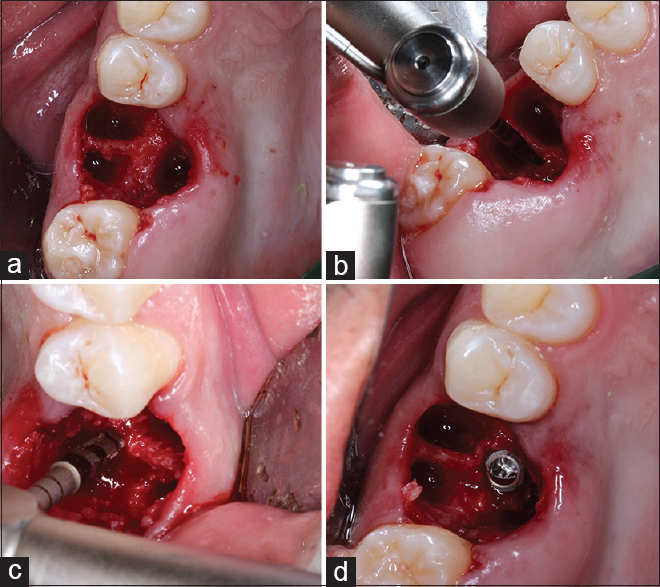 After implant placement, Xenogene Biomaterial (Lumina-Bone Porous ®, Critéria Biomateriais, São Paulo, Brazil) was inserted with blood-derived growth factors in the socket gap, between the implant surface and the remaining buccal bone. Platelet-rich fibrin (PRF) membrane was used to close the open wound in the oral cavity, preventing exposure of the bone graft. This technique was described by Mourão and Mourão. The PRF protocol has been described by several authors.,,,, The blood sample was collected (Labor Import ®, São Paulo, Brazil) and inserted into a centrifuge with a 400 g-force vertical rotor (Kasvi, Paraná, Brazil) [Figure 4]a and [Figure 4]b. After centrifugation, the PRF was collected and stored in a box (Nitinox Solutions S.L. [ref 212.029], Rio de Janeiro, Brazil), and the process of removing the exudate from the membrane. After finishing the production of the PRF, it was installed in the lower part of a 4.5 × 6 × 3.5 abutment (INTRAOSS ®, São Paulo, Brazil) with a posterior collagen membrane (Critéria ®, São Paulo, Brazil) [Figure 5]a. With this, the PRF was exposed to the oral cavity in contact with the provisional crown [Figure 5]b and [Figure 6]. The radiographic evaluation was performed through CBCT examinations at three surgical stages (preoperative, transoperative, and immediately after implant installation). The region of the procedure (left jaw) contained cancellous bone. After qualitative analysis of the axial view [Figure 7]a, [Figure 7]b, [Figure 7]c, a suggestive densification was evident [Figure 7]b around the new surgical site, created by osseodensification. In the coronal view as well [Figure 8]a, [Figure 8]b, [Figure 8]c, a suggestive image of corticalization was present around the surgical site, different from what can typically be observed in a natural dental socket after exodontia [Figure 8]b. Immediate loading is a viable treatment option. The main advantage of this approach is the reduction of treatment time and esthetic-functional rehabilitation., The search for immediate loading is considered multifactorial where the primary prerequisite is good primary stability.,,, One of the alternatives presented by the scientific community was the development of osseodensification, which qualifies as a possible technique in the search for stability. There is a publication where osseodensification is misrepresented. 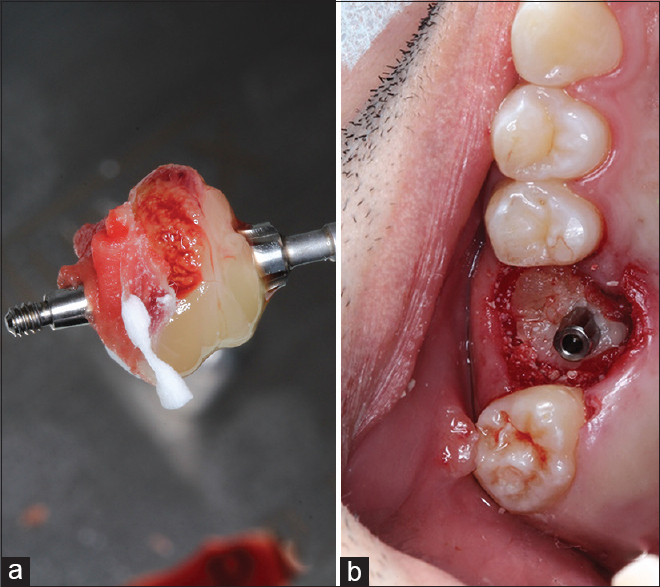 This specific study claimed that there is no real gain of implant stability with osseodensification at the time of implant installation compared with standardized milling. In this murine animal model study, osseodensification was not used, so describing this article as a finding that osseodensification does not increase implant stability is not valid. The author needs to point out the fact that this article is not related to osseodensification because it was not used in his study process. In the present work, it was possible to clinically observe a gain in primary stability. Despite the fact that the literature reports evidence for the presence of densification in computed microtomography. in this case, CBCT images demonstrated clearly the densification of the bony walls after instrumentation using osseodensification burs. Exposure of the implant to the oral cavity is always a possibility in clinical practice after implant placement. Hence, techniques to avoid exposure of the graft to the oral cavity have been used, for example, the use of connective tissue grafts and keratinized tissue grafts. These techniques have low infection rates, and there is no rejection; however, they require a highly skilled dental surgeon and may increase surgical morbidity due to the need for a donor site. The present case report aims to stimulate further randomized and controlled clinical studies on the use of the osseodensification technique. The evaluation of density before the dental implant placement is recommended, due to the potential for production of artifacts in tomographic images. We have also obtained a better scientific understanding of the gain in stability with the technique, as already described in other (in vitro and in vivo) studies. In this case, the clinical and radiographic results obtained, following the initial planning, direct the dental surgeon to accept the hypothesis of the real gain in primary stability achieved with the use of the osseodensification technique. It is a new bone instrumentation technique that relies on bone tissue preservation and compaction-autografting, and as any new treatment modality, it may require a learning curve to achieve reproducible success. Trisi P, Berardi D, Paolantonio M, Spoto G, D'Addona A, Perfetti G. Primary stability, insertion torque, and bone density of conical implants with internal hexagon: Is there a relationship? J Craniofac Surg 2013;24:841-4. Giro G, Tovar N, Marin C, Bonfante EA, Jimbo R, Suzuki M, et al. The effect of simplifying dental implant drilling sequence on osseointegration: An experimental study in dogs. Int J Biomater 2013; 2013:230310. Javed F, Romanos GE. The role of primary stability for successful immediate loading of dental implants. A literature review. J Dent 2010;38:612-20. Jimbo R, Janal MN, Marin C, Giro G, Tovar N, Coelho PG, et al. The effect of implant diameter on osseointegration utilizing simplifi ed drilling protocols. Clin Oral Implants Res 2014;25:1295-300. Jimbo R, Giro G, Marin C, Granato R, Suzuki M, Tovar N, et al. Simplifi ed drilling technique does not decrease dental implant osseointegration: A preliminary report. J Periodontol 2013;84:1599-605. Sarendranath A, Khan R, Tovar N, Marin C, Yoo D, Redisch J, et al. Effect of low speed drilling on osseointegration using simplifi ed drilling procedures. Br J Oral Maxillofac Surg 2015;53:550-6. Lekholm U, Zarb G Patient selection and preparation. In: Branemark PI, Zarb GA, Albrektsson T, editors. Tissue-Integrated Prostheses: Osseointegration in Clinical Dentistry. Chicago, IL: Quintessence; 1985. p. 199-209. Seeman E, Delmas PD. Bone quality – The material and structural basis of bone strength and fragility. N Engl J Med 2006;354:2250-61. Summers RB. A new concept in maxillary implant surgery: The osteotome technique. Compendium 1994;15(2):152, 154-6, 158 passim; quiz 162. Degidi M, Daprile G, Piattelli A. Infl uence of underpreparation on primary stability of implants inserted in poor quality bone sites: An in vitro study. J Oral Maxillofac Surg 2015;73:1084-8. Huwais S, Meyer EG. A novel osseous densifi cation approach in implant osteotomy preparation to increase biomechanical primary stability, bone mineral density, and bone-to-implant contact. Int J Oral Maxillofac Implants 2017;32:27-36. Friberg B, Ekestubbe A, Mellström D, Sennerby L. Brånemark implants and osteoporosis: A clinical exploratory study. Clin Implant Dent Relat Res 2001;3:50-6. Friberg B, Ekestubbe A, Sennerby L. Clinical outcome of brånemark system implants of various diameters: A retrospective study. Int J Oral Maxillofac Implants 2002;17:671-7. Lopez CD, Alifarag AM, Torroni A, Tovar N, Diaz-Siso JR, Witek L, et al. Osseodensifi cation for enhancement of spinal surgical hardware fi xation. J Mech Behav Biomed Mater 2017;69:275-81. Trisi P, Berardini M, Falco A, Podaliri Vulpiani M. New osseodensifi cation implant site preparation method to increase bone density in low-density bone: In vivo evaluation in sheep. Implant Dent 2016;25:24-31. Lahens B, Neiva R, Tovar N, Alifarag AM, Jimbo R, Bonfante EA, et al. Biomechanical and histologic basis of osseodensifi cation drilling for endosteal implant placement in low density bone. An experimental study in sheep. J Mech Behav Biomed Mater 2016;63:56-65. Alifarag AM, Lopez CD, Neiva RF, Tovar N, Witek L, Coelho PG. Temporal osseointegration: Early biomechanical stability through osseodensification. J Orthop Res 2018; Epub ahead of print. Riley DS, Barber MS, Kienle GS, Aronson JK, von Schoen-Angerer T, Tugwell P, et al. CARE guidelines for case reports: explanation and elaboration document. J Clin Epidemiol. 2017; 89: 218-35. Gehrke SA, Sardá JA Jr., Pérez-Albacete Martínez C, Ramirez Fernandez MP, Maté Sánchez de Val JE, Calvo-Guirado JL. 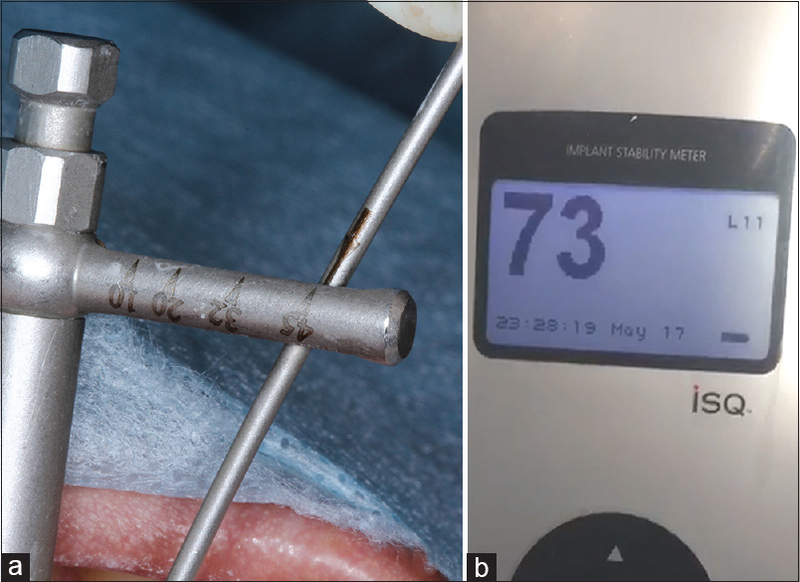 The infl uence of drill length and irrigation system on heat production during osteotomy preparation for dental implants: An ex vivo study. Clin Oral Implants Res 2016;4:1-7. Mourão C, Mourão N. Platelet-rich fi brin membrane in immediate dental implant loading. Dent Press Implantol 2015;9:104-9. Dohan DM, Choukroun J, Diss A, Dohan SL, Dohan AJ, Mouhyi J, et al. Platelet-rich fi brin (PRF): A second-generation platelet concentrate. Part I: Technological concepts and evolution. Oral Surg Oral Med Oral Pathol Oral Radiol Endod 2006;101:e37-44. Dohan Ehrenfest DM, Bielecki T, Jimbo R, Barbé G, Del Corso M, Inchingolo F, et al. Do the fi brin architecture and leukocyte content infl uence the growth factor release of platelet concentrates? 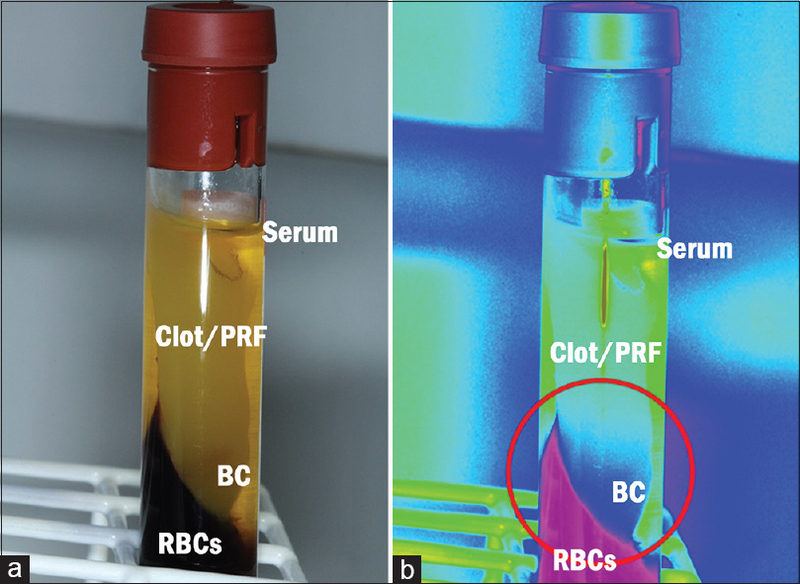 An evidence-based answer comparing a pure platelet-rich plasma (P-PRP) gel and a leukocyte- and platelet-rich fi brin (L-PRF). Curr Pharm Biotechnol 2012;13:1145-52. Dohan D, Del Corso M, Diss A, Mouhyi J, Charrier JB. Three dimensional architecture and cell composition of a Choukroun's platelet-rich fi brin clot and membrane. Curr Pharm Biotechnol 2012;13:546-55. De Andrade L, Leite L, De Melo Silva F, De Brito Resende RF, Guedes De Uzeda MJ. The use of platelet-rich fibrin concentrate in tissue healing and regeneration in dentistry. Int J Growth Factors Stem Cells Dent 2018;1:23-6. Nemcovsky CE, Artzi Z, Moses O. Rotated palatal fl ap in immediate implant procedures. Clinical evaluation of 26 consecutive cases. Clin Oral Implants Res 2000;11:83-90. 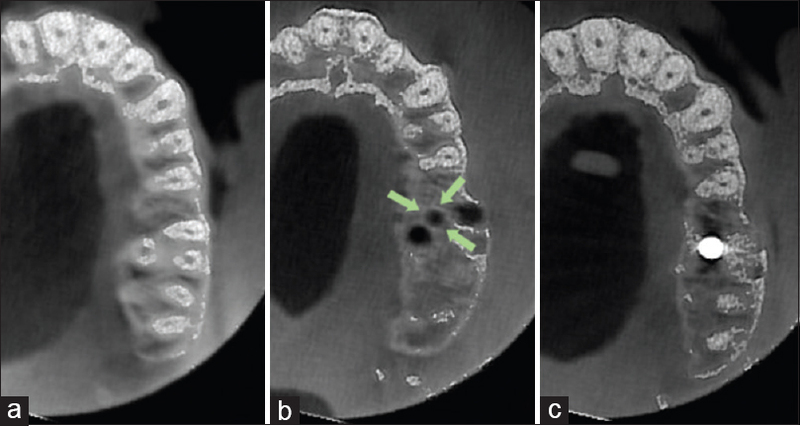 De Bruyn H, Vandeweghe S, Ruyffelaert C, Cosyn J, Sennerby L. Radiographic evaluation of modern oral implants with emphasis on crestal bone level and relevance to peri-implant health. Periodontol 2000 2013;62:256-70. Zhang S, Wang S, Song Y. Immediate loading for implant restoration compared with early or conventional loading: A meta-analysis. J Craniomaxillofac Surg 2017;45:793-803. Milillo L, Fiandaca C, Giannoulis F, Ottria L, Lucchese A, Silvestre F, et al. Immediate vs. non-immediate loading post-extractive implants: A comparative study of implant stability quotient (ISQ). Oral Implantol (Rome) 2016;9:123-31. Norton MR. The infl uence of low insertion torque on primary stability, implant survival, and maintenance of marginal bone levels: A closed-cohort prospective study. Int J Oral Maxillofac Implants 2017;32:849-57. Wang L, Wu Y, Perez KC, Hyman S, Brunski JB, Tulu U, et al. Effects of condensation on peri-implant bone density and remodeling. J Dent Res 2017;96:413-20. Barros Mourão CF, Gheno E, Lourenço ES, Barbosa Rd, Kurtzman GM, Javid K, et al. Characterization of a new membrane from concentrated growth factors associated with denaturized Albumin (Alb-CGF) for clinical applications: A preliminary study. Int J Growth Factors Stem Cells Dent 2018;1:64-9.